Gold prices have been taking a pounding of late with today’s session on the NYSE witnessing a close of $1277.80/oz, with poor man’s gold, silver, closing at $19.82. The gold Bugs index (HUI) also took it on the chin losing around 7.5%. With this environment as a back cloth it is understandable that the juniors in this sector also had a torrid time with Market Vectors Junior Gold Miners ETF (GDXJ) losing 9.78% to close at $9.32. So it begs the question; is GDXJ now a buy? As an investment vehicle this ETF seeks to replicate as closely as possible, before fees and expenses, the price and yield performance of the Market Vectors Junior Gold Miners Index. The attraction of this fund for investors is the ability in invest in a myriad of small to medium sized companies in the gold and/or silver mining space. The fortunes of this fund are in turn predicated on gold and silver prices maintaining price levels that are profitable to mine. 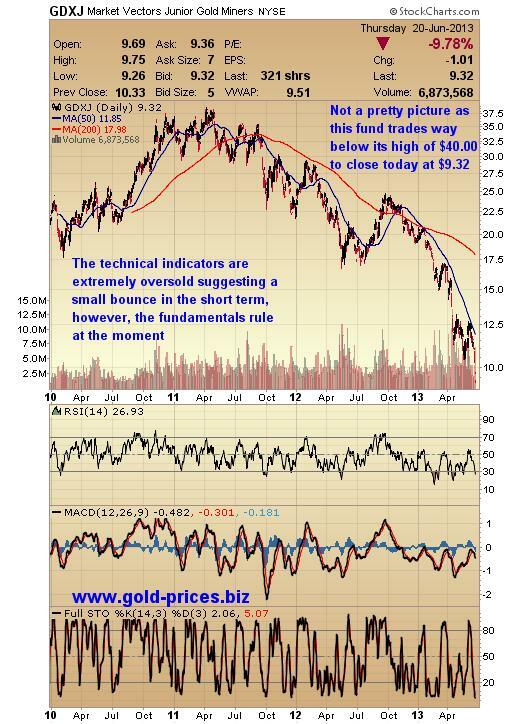 The above chart depicts GDXJ’s fall from grace. We could analyze the technical indicators, but at this juncture it is the high level of sell orders in the paper market and the low level of sentiment that is driving prices south and until that thirst is slaked there could be more selling to come. GDXJ trades on the NYSE and has a market capitalization of $1.38 billion; a 52 week high of $25.66 and 52 week low of $9.26, the liquidity is good with around 3 million shares traded per day, although it can spike dramatically from time to time. There are 133,600,000 shares outstanding. The dividend payment has experienced rather an erratic performance so far, $2.93 in 2010, $0.03 in 2011 and $0.75 in 2012. We should also note that some of the juniors are running low on cash and may need some help from a friendly banker to keep them in the swim, getting a loan won’t be easy given the current state of play. At $9.32 it could be argued that it is cheaper to buy GDXJ now, however, that does not mean it is a bargain, it can still go lower. You have only to scan this financial landscape to see any number of good quality mining stocks trading at half the price they were a year ago. Also remember that the cash costs of production have been increasing at a fair pace and can be as high as $1200/oz to $1300/oz, so unless there is a rapid recovery in both silver and gold prices, a number of mines may have to close. Yes this would take some of the supply off the market but there would be a time lag before this impact was felt. Other considerations are the summer doldrums, a rather slow period for the precious metals sector, so our expectation is for further weakness, unless the dead cat dollar falls out of bed. The NFP jobs numbers appear to satisfy our political masters which have led to more talk of tapering QE, which has certainly put a cap on gold’s progress. This may change given the reaction of the DOW, down 353 points today and the current economic fragility that exists almost worldwide. We will cross that bridge if and when it comes, but for now we have a down trend or retracement in place, until it comes to a halt we will trade accordingly. As bulls we can sit it out and hope for this period of consolidation to run out of steam or we can recognize it for what it is; an opportunity to trade on the ‘short’ side. If you are not one of the giants in this field then you are small enough to adapt rapidly and change your trading strategy to match the current trends and make it work for you. This is a time when you use your ‘opportunity cash’ to generate profits or at least to get some insurance against your current portfolio. This strategy is helping us to generate cash and place us in a good position financially at a time when the gold and silver market is being taken to the wood shed. Once again we can only conclude that GDXJ is not for us and until we can detect a reversal in gold’s fortunes it will stay that way. On a positive note the summer will come to an end and usually by Labor day in the United States, 02 September, things pick up for the precious metals sector, should that coincide with the exhaustion of the selling, then we could be in for a real treat. The issue then will be about raising enough courage and the cash to hit the acquisitions trail with a vengeance. Start your planning now and be prepared for when the opportunity presents itself. Disclaimer: www.gold-prices.biz or www.skoptionstrading.com makes no guarantee or warranty on the accuracy or completeness of the data provided. Nothing contained herein is intended or shall be deemed to be investment advice, implied or otherwise. This letter represents our views and replicates trades that we are making but nothing more than that. Always consult your registered adviser to assist you with your investments. We accept no liability for any loss arising from the use of the data contained on this letter. Options contain a high level of risk that may result in the loss of part or all invested capital and therefore are suitable for experienced and professional investors and traders only. Past performance is neither a guide nor guarantee of future success.